The New London Community Orchestra seeks to serve New London and the surrounding region by providing an opportunity for volunteer musicians to play while also offering outreach to the community in the form of concerts and music education. As part of our mission, we offer a free program of string instrument lessons for local students at the New London Public Library. Click on the Music City Strings tab for more information. Rehearsals take Wednesday evenings at 7 p.m. at the St. James Church Parish Hall, 76 Federal St., New London. See the Member Info section for more information and the current rehearsal schedule. 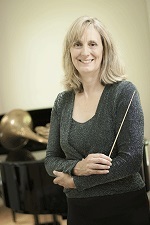 The New London Community Orchestra is led by Music Director and Conductor, Dr. Hilarie Clark Moore. Dr. Moore has extensive background both as a performer and a conductor and has had many years of experience creating, building, and enhancing community orchestras. She was the founding conductor of the SUNY Orange Community Orchestra in Middletown, New York, for 20 years, and currently serves as the Music Director/Conductor for the Cheshire Symphony Orchestra. Learn more here. It’s tax deductible. NLCO is a 501(c)(3) organization. Music City Strings offers a program of free violin and cello lessons at the New London Public Library. ©2019 New London Community Orchestra.